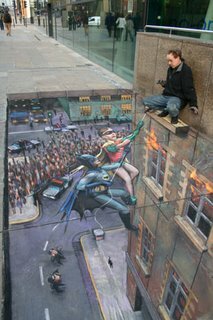 Reading about Kim Keever here brought to mind Julian Beever, and not just for the rhyme. Beever is another artist who creates works for the camera, in his case in chalk on sidewalks. In fact his camera serves two roles: first, to help him visualize his amazing trompe l’oeil drawings, and then to record them, often with Beever himself hamming it up in the picture. Since from most angles they look so distorted as to be abstract, half the charm of his photos lies in the baffled looks of passers-by. They're also a nice if rather extreme example of something Sam Abell among others often talks about: how even the smallest change in camera position can make the difference between a shot that works and one that doesn't. Woof! Man, to be able to think in that dimensionality & then pull it off with the camera tricks. What a precognitive set that must be! Velly nice indeed with the conga players in the background. I saw that in London when it was a bit washed out. People were just ignoring it! I thought it was amazing.